The Arizona Department of Health Services (ADHS) is leading the development of a statewide climate and health adaptation plan as a participating agency in the U.S. Centers for Disease Control and Prevention’s (CDC) ClimateReady States and Cities Initiative. 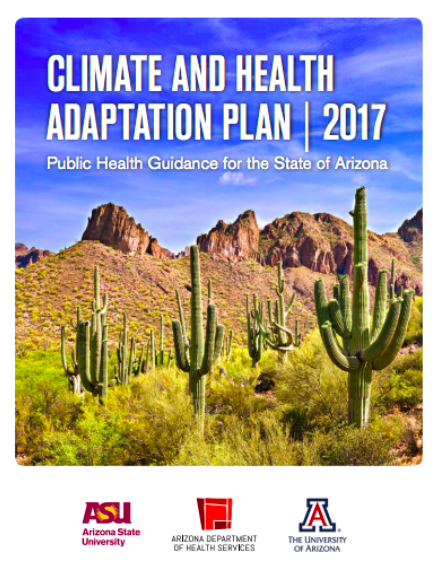 This document, released in April 2017, is the first version of Arizona’s Climate and Health Adaptation Plan (ACHAP). The goal of ACHAP is to support the mission of the ADHS: to promote, protect, and improve the health and wellness of individuals and communities in Arizona. In coordinating ACHAP, ADHS intends to support the development of interventions and enhancement of public health preparedness activities related to climate-sensitive hazards and minimize adverse impacts on the people of Arizona. The guidance contained herein was generated using the ongoing work of current and future collaborations and through review and collaboration with other states. ACHAP 2017 serves to compile ideas, direction, and activities that stakeholders may wish to adapt in building resilience against the effects of climate-sensitive hazards. This document is intended to serve as a tool for state and local agencies to support related public health initiatives. Furthermore, it is intended to promote communication among partners by highlighting successful local and regional efforts and by exploring and reviewing new ideas.